Access for 1 (one) to the LepreCon Alley Fenway St Paddy's Pub Crawl on Saturday March 16. Access to ALL participating venues. THE FANEUIL HALL "LUCK OF THE IRISH" PUB CRAWL ! Fenway Park, the undisputed Cathedral of Boston. While we are all anticipating the start of Baseball season, St Patrick's Day comes first! Great ready for the warming up of Spring by coming out and crawling the best bars that Fenway has to offer. With a population of over 40,000 people squeezed into 1.24 square miles, you are sure to find a plethora of party goers each and every weekend in Fenway. St Patrick's Day weekend is no exception. Bask in the glory of Saint Patrick, dressed in the greenest outfits you can find in your entire closet. The Whiskey Shots and Drafts Beers will be ready for the thousands of crawlers eager to hit the streets for this festive annual occasion. This event encompasses all the aspects of an unbelievable holiday festival - St Patrick's Day weekend, with a starting point at a large epic venue, in one of the most iconic cities in all of Massachusetts. Party this St Paddy's like never before with the annual LepreCon St Paddy's weekend bar crawl! Participating venues include Cheeky Monkey, Loretta's Last Call, Lansdowne Pub, Bar Louie, The Baseball Tavern, and more to be announced! Morning: Lucky Strike/Cheeky Monkey – Irish Coffee Stations; Guests can personalize an Irish Coffee and wait for their friends while learning about Kilbeggan, receive a KilbegganXPubCrawl t-shirt and find out all about the activations to take place in the afternoon! Afternoon: 4 Bars to be themed as Dublin, Galway, Kilbeggan and Cork. Activations will be themed around rugby, Irish language, Kilbeggan Whiskey history and genealogy. Giveaways across these bars will include Kilbeggan scally caps, booklets, t-shirts, chocolates and other swag. The FULL list of participating bars will be distributed at registration by our event staff. 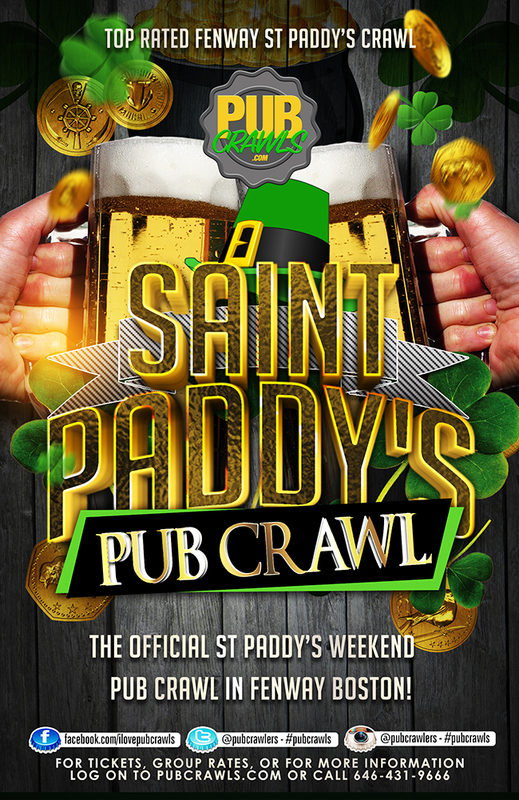 The Drink Specials being offered throughout the town will also be listed on the annual St Paddy's Pub Crawl Map!